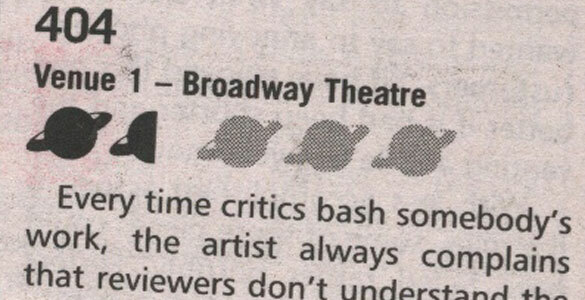 Every time critics bash somebody’s work, the artist always complains that reviewers don’t understand the amount of effort that goes into creating a piece of art. Well, the best thing I can say about “404” is that there was certainly a good deal of effort involved in creating this production. The self-proclaimed rock opera (pop extravaganza would be more appropriate) mixes theatre, video, and live music but fails to blend these disciplines effectively. Terrible sound made it truly hard to understand the play, so here’s a summary. A psychiatric hospital uses an ingenious gimmick to get responses from its catatonic patients: entertainment. Country music and the possibility of love are used as stimuli, but an unnamed resident takes the supposed advances of a fellow patient a little too seriously and threatens to unmask the “clever” device. 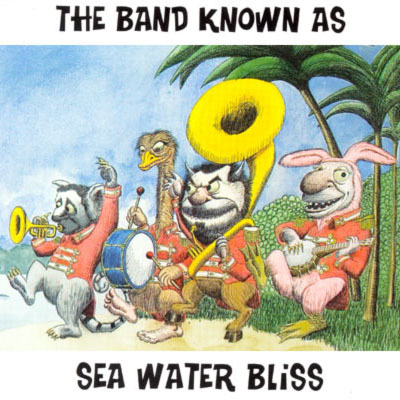 The plot can’t stand by itself so it relies heavily on its music, courtesy of The Band Known As Sea Water Bliss. Sometimes reminiscent of the Eagles, sometimes of 10,000 Maniacs, the songs are much better than anything else on stage. To have the patient talking to his love interest through a TV monitor is just corny unless you play the “camp” card (which they didn’t). “404” could have perhaps worked as a straight comedy that didn’t take itself so seriously.